1Universidade Federal da Paraíba/Centro de Ciências Agrárias, Areia, Paraíba, Brazil. 2Instituto Federal de Educação, Ciência e Tecnologia do Ceará, Tianguá, Ceará, Brazil. 4Universidade Federal do Vale do São Francisco/Centro de Ciências Agrárias, Petrolina, Pernambuco, Brazil. The yellow passion fruit (Passiflora edulis Sims.) is commercially grown throughout Brazil and in both tropical and subtropical regions due to soil and climatic conditions, which favour its development (Silva-Matos et al., 2016). This crop occupies a relevant place in tropical fruit farming and is considered a promising agricultural alternative for small estates due to its rapid economic return and year-round revenue (Meletti, 2011). The field explored by the passion fruit has been increasing over the last several years; however, because its productive potential may reach 50 t ha-1, the mean productivity is considered low, approximately 14 t ha-1 (Meletti, 2011). Thus, despite advances in agricultural research and investments in new genotypes, the productive channel of this fruit tree still has issues that, in part, may be related to fertilization inadequacy and plant nutrition, resulting in low productivity. Phosphorus is a crucial nutrient in plant metabolism, playing an important role in storage and energy transference, respiration and the photosynthetic process (Marschner, 2012). Yellow passion fruit requirements for phosphorus are relatively low compared to those for N and K, being the fourth-most accumulated nutrient in plant leaf dry mass (Malavolta et al., 1997; Carvalho et al., 2011; Cavalcante et al., 2012). However, it is an element supplied in large quantities in fertilization in Brazil, because of its high fixation capacity in tropical soils. Phosphorus fertilization is essential for passion fruit plants, as research results indicate that adequate dose supplies stimulate plant growth, thus improving nutritional status during the seedling (Prado et al., 2005; Vitorazi Filho et al., 2012; Silva et al., 2015) and mature stages (Borges et al. 2002a; Kondo and Higuchi, 2013). However, despite the importance of this macronutrient in plant nutrition and the microbiological effects on its availability (Martínez et al., 2015), there is a lack of recent information about phosphorus’s effects on passion fruit nutritional status during the productive stage and in field conditions. In addition to adequate doses, one must consider, at the moment of fertilization, the source of phosphorus that will be used, as this influences the plants’ nutritional supplies and the economic viability for the farmer (Barbosa et al., 2015). Market sources differ in their P contents and in other nutrients such as Ca and S as well as solubility, access and market prices. Source evaluation and phosphorus dose studies are crucial for economically viable harvest of yellow passion fruit. The aim of this study was to evaluate the nutritional status of yellow passion fruit plants under fertilization with different sources and doses of phosphorus. Growth activities were carried out from March 2010 to July 2011 (Santos et al., 2014) and those related to plant nutritional status from March to July 2010. The experiments were conducted in Remígio (6º53’00’’S / 36º02’00’’W, 470 m), in the Curimataú Ocidental semiarid region, Paraíba state, Brazil. The climate is As’-type according to Köppen’s classification (Alvares et al., 2013), warm and dry. The rainfall recorded from January to July 2010 was 576 mm, the mean air temperature was 24.5 ºC and the average relative humidity was 81%. The soil is classified according to Embrapa (2013) as Dystrophic Typic Quartzipsamment (Entisol), with a declivity of 4%. Before the application of the treatments, a chemical and physical characterization was completed in soil samples at a depth of 0-40 cm (Table 1) according to the suggested methodologies of Embrapa (2011). 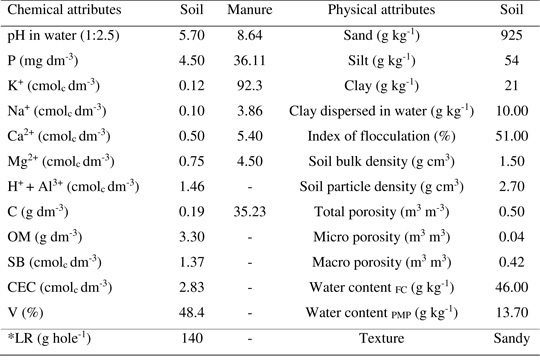 Table 1: Soil chemical and physical characterization for fertility and fertilization at a depth of 0-40 cm and chemical attributes of bovine manure used in the experiment. P, K and Na+ = Mehlich 1 extractor; Al3+, Ca2+, Mg2+ = extractor KCl 1M; C = Organic carbon; OM = Organic matter in the soil by oxidation with potassium permanganate; SB = Sum of bases (Na+ + K+ + Ca2+ + Mg2+); CEC = Cation exchange capacity = SB + (H+ + Al3+); V = Exchangeable base saturation (100*SB/CEC); LR = Liming requirement. The yellow passion fruit (Passiflora edulis Sims) cv IAC 273/277 + 275 was cultivated in a 3 × 3 spacing, using a simple espalier system for plant support, with flat wire nº 12, built to a height of 2.2 m, at the apex of the cuttings. The planting pits were dug in a 40 × 40 × 40 cm dimension and prepared with 10 L of bovine manure with a C/N ratio of 18:1 (Table 1) and 12 g of dolomitic limestone (PRNT 80%, 26% of CaO and 14% of MgO) to enhance the soil base saturation percentage to 70%, according to Borges et al. (2002b). Treatments were distributed in randomized blocks, with three replicates and 12 plants per parcel, in a 2 × 5 factorial design, with two phosphates sources (simple superphosphate - 18% P2O5, 18 in 20% Ca, 12% S and triple superphosphate - 42% P2O5, 12 in 14% Ca), in doses of 0, 12, 18, 24 and 30 g hole-1 of P2O5 in two equal applications at 60 and 120 days after seedling transplantation in the field, totalling 0, 24, 36, 48 and 60 g hole-1 of P2O5 broadcast supplied in a 0.5 m2 area within a 40 cm radius from the plant stalk, where there is the highest proportion of active roots (Sousa et al., 2002). The fertilizer doses studied were defined according to soil analysis following the recommendations of Ribeiro et al. (1999). Fertilization with nitrogen and potassium, before orchard nutritional status determination, was carried out in the same area (0.5 m2) as phosphate fertilization, in three applications under a proportion of 1N:1K2O, assuming as sources, respectively, urea (44% N) and potassium chlorite (58% K2O). After 60 and 90 days, respectively, 10 g of N and 10 g of K2O were supplied, and 15 g of N and 15 g of K2O were supplied at the beginning of flowering 120 days after planting according to Borges et al. (2002b). These values correspond to the application of 35 g plant-1 of N and K2O, corresponding to 80 and 60 g plant-1 of urea and potassium chlorite, referring to 90 and 67 kg ha-1 of the mineral fertilizer, respectively, before plant fructification. Irrigation was performed using a locally applied dripping method, with two emitters under a flow rate of 3.75 L h-1 at 20 cm from plant stalks, based on the crop evapotranspiration (ETc) estimated with reference to the evapotranspiration product (ET0) of the crop coefficient of 1.2 (Souza et al., 2009), during the flowering stage at the end of harvesting. The ET0 (ECA × 0.75) was obtained based on measured evaporation in a Class A pan installed at the experimental site. At 150 days after seedling transplantation, when the orchard was fruiting, samples were individually collected following the instructions of Malavolta et al. (1997), i.e. 48 leaves of healthy median branches (4th leaf from branch apex) for each parcel, for evaluation of N, P, K, Ca, Mg, S, B, Cu, Fe, Mn, Zn and Na in plant leaf dry mass, according to the methodology described by Bataglia et al. (1983). The results were submitted to variance analysis using the F-test. The mean values of the P2O5 sources were compared using the F-test, which is conclusive for both factors, and the evaluation doses were evaluated by polynomial regression using the Sisvar software (Ferreira, 2014). According to variance analysis, among the macronutrients, the N leaf contents from yellow passion fruit plants were significantly influenced by the isolate action of P2O5 source and doses; P and K contents were influenced by the P2O5 doses and Ca, Mg and S responded to the interaction source x dose of P2O5 (Table 2). DF = Degrees of freedom; ns = Not significant; * and **, respectively, represent p<0.05 and p<0.01; CV = Coefficient of variation. The leaf content of N was significantly higher in plants where the P2O5 was supplied as triple superphosphate, compared to that of those treated with simple superphosphate (Figure 1A). 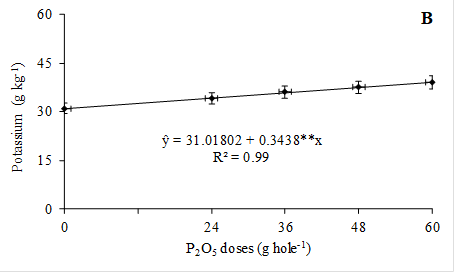 The increase in P2O5 dose, independently of the source used, enhanced N leaf content up to a maximum value of 47.0 g kg-1 for the 34.1 g hole-1 P2O5 dose (Figure 1B). Figure 1: Leaf content of nitrogen in yellow passion fruit plants as a function of sources (A) and doses (B) of P2O5. 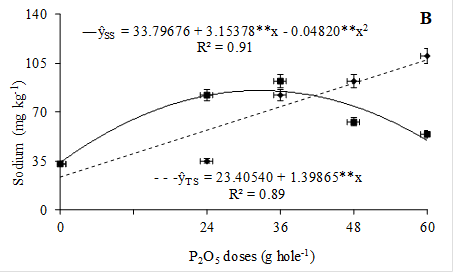 In relation to P leaf contents, it is possible to infer that independently of the P source, the P leaf content was enhanced up to 4.2 g kg-1 for the dose of 36.9 g hole-1 of P2O5 (Figure 2A). Figure 2: Phosphorus (A) and potassium (B) leaf contents in yellow passion fruit plants as a function of P2O5 doses. The K leaf content in the passion fruit plants was linearly enhanced with an increase in P2O5 dose supplied to the soil (Figure 2B). Regarding Ca, it was observed that plants treated with simple superphosphate had Ca contents linearly enhanced as a function of P2O5 dose, achieving a maximum Ca value of 20.19 g kg-1 with a P2O5 dose of 60 g hole-1 (Figure 3A). Indeed, the leaf contents of Ca in plants treated with simple superphosphate were higher than those treated with triple superphosphate (Figure 3A). Figure 3: Calcium (A), magnesium (B) and sulfur (C) leaf contents in yellow passion fruit plants as a function of P2O5 doses of simple superphosphate (-) and triple superphosphate (---). The sources of P displayed the opposite effects for Mg leaf contents, as compared to Ca (Figure 3B). 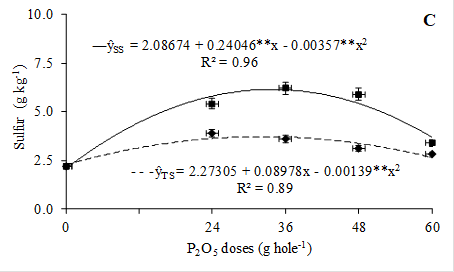 In plants treated with triple superphosphate, the increase in P2O5 dose enhanced Mg contents up to a maximum value of 9.74 g kg-1, for the 38.0 g hole-1 of P2O5 dose. In contrast, the plants treated with simple superphosphate had Mg contents that linearly decreased from 7.8 to 4.66 g kg-1. The S leaf contents were enhanced up to 6.13 and 3.72 g kg-1 for P2O5 doses of 33.68 and 32.29 g hole-1, using simple and triple superphosphate, respectively (Figure 3C). Regarding micronutrients, it was verified that only B leaf content significantly responded to the isolated effects of the provided phosphorus sources (Table 3). The Cu, Fe, Mn and Zn contents were not significantly affected from either of the sources adopted. Table 3: Overview of variance analysis by mean square regarding leaf contents of boron, copper, steel, manganese, zinc and sodium contents in leaf dry mass of yellow passion fruit plants exposed to P2O5 sources and doses. The B leaf contents were higher in yellow passion fruit plants fertilized with simple superphosphate (Figure 4A). As seen in Table 4, the Cu leaf contents (6-9 mg kg-1 for simple superphosphate and 5-8 mg kg-1 for triple superphosphate) and Mn leaf contents (62-76 mg kg-1 for simple superphosphate and 66-75 mg kg-1 for triple superphosphate) presented a large range. Additionally, Fe leaf contents ranged from 133 to 127 mg kg-1 for simple superphosphate and from 100 to 121 mg kg-1 for triple superphosphate, while Zn leaf contents ranged from 32-39 mg kg-1 (simple superphosphate) and 32-40 mg kg-1 (triple superphosphate). The yellow passion fruit plants subjected to a P supply, in a triple superphosphate form, had Na leaf contents enhanced linearly, with a maximum value 107.3 mg kg-1 for a P2O5 dose of 60 g hole-1 (Figure 4B). Moreover, the Na contents were enhanced up to 85.4 mg kg-1, with the increase in simple superphosphate form up to an estimated maximum P2O5 dose of 32.7 g hole-1. Indeed, plants treated with simple superphosphate presented lower Na leaf content compared to those fertilized using triple superphosphate. Table 4 Mean contents of copper, iron, manganese and zinc in yellow passion fruit plant leaf dry mass exposed to P2O5 sources and doses. ns = non-significant; SS = Simple superphosphate; TS = Triple superphosphate. Higher N leaf content in plants fertilized with triple superphosphate occurred because the higher P concentration in the triple superphosphate has a positive action on N absorption in photosynthetic reactions and C metabolism, processes that are fundamental for assimilation and utilization of N and P (Malavolta et al., 1997; Brown et al., 2011). The increase in N contents in fertilized plants with P was also observed by Silva et al. (2015) in wild passion fruit (Passiflora edulis) and by Lemos et al. (2015) in coffee (Coffea arabica) plants. Moreira et al. (2016) attested that fertilization with phosphorus enhanced the nitrogen accumulation in pitaya plants (Hylocereus undatus). According to Brown et al. (2011), there is a strong correlation between N and P contents, indicating that these nutrients interact in a synergistic way, where adequate doses of both nutrients promote enhancement of each other’s absorption, while inhibition occurs when the nutrients are applied in excessive amounts (Cerutti and Delatorre, 2013). Despite the N content decrease with application of P doses higher than the maximum physical efficiency, it was noted that, except in the testing dose, the levels obtained are in range of 40-50 g kg-1, considered adequate by Malavolta et al. (1997) for the yellow passion fruit (Figure 1B). Leaf P content as shown in Figure 2A above 4.2 g kg-1 is adequate for a yellow passion fruit crop, since it is within the range of 4-5 g kg-1 (Malavolta et al., 1997). These results are in accordance with those verified by Brunetto et al. (2015) when attesting that phosphate fertilization enhanced P content in soil and pear tree leaves (Pyrus communis L.). Moreira et al. (2016) attested that the phosphate fertilization in pitaya plants enhanced P content and its accumulation in plants. The leaf P content reduction in plants submitted to doses greater than 36.9 g hole-1 of P2O5 is possibly linked to a greater stimulus of biomass production, which may result in dilution of P content in leaf dry mass. According to Barretti et al. (2008), when a chemical analysis is performed in a shoot, the same dry material quantity is used in all samples, and nutrients are extracted from it; in larger plants, the nutrients are less concentrated due to the greater area, and thus, lower nutrient levels may occur in plants with higher vegetal mass. It is important to note that plant species could present different P strategies to acquire P from soil, and this is important in defining crop management strategies at improving P use (Sandaña and Pinochet, 2016), especially for poorly studied species such as passion fruit. Leaf K concentration enhancement with higher P2O5 doses (Figure 2B) was also observed by Prado et al. (2005) in passion fruit seedlings submitted to phosphorus doses, with a verified linear increase in leaf and root content of K. Silva et al. (2015) also attested that phosphate fertilization enhances K leaf content in larger passion fruit plants. The presence of P and Ca in two sources and S in simple superphosphate favours root growth, which expand to a greater soil volume, contributing to higher water and nutrient absorption by the plants (Marschner, 2012; Moreira et al., 2016). In contrast, when the Ca ranges from low to adequate concentrations in leaf tissues (condition verified in Figure 3A), it favours K absorption as a synergistic effect (Malavolta et al., 1997). Malavolta et al. (1997) attested that K leaf contents between 35-45 g kg-1 are adequate for yellow passion fruit growth and production. According to the results herein presented in Figure 2B, for yellow passion fruit plants whose K content must be greater than 35 g kg-1, P2O5 doses greater than 30 g hole-1 would be necessary, independent of the supply source. The leaf Ca contents with P2O5 dose enhancement was a result of the higher input of calcium in the soil as a function of higher simple superphosphate doses, which contains more Ca in its formulation than the triple superphosphate (18-20%, while triple superphosphate has 12-14%). In contrast, the Ca leaf contents in plants treated with triple superphosphate did not adjust to any mathematic model, being represented by the Ca mean value 14.64 g kg-1. Similar results were observed by Borges et al. (2002a), Prado et al. (2005) and Neves et al. (2008) in leaf contents of Ca in passion fruit and umbu (Spondias tuberosa) plants, respectively, under phosphate fertilization, using triple superphosphate doses. The lack of significance reported for Ca leaf contents should be caused by the high Ca bovine manure value (Table 1) used in the experiment, according to Borges et al. (2002b). Considering adequate Ca contents for the passion fruit are between 15-20 g kg-1 (Malavolta et al., 1997), the plants fertilized with triple superphosphate were properly supplied with this nutrient only for doses up to 36 g hole-1 of P2O5, while all the P2O5 doses provided by simple superphosphate resulted in adequate supply for plants with Ca. Presumably the Ca amount provided by the triple superphosphate was not sufficient to supply the plants’ requirements for this macronutrient. The incongruent effects of the different P2O5 sources on Mg leaf content differs from Prado et al. (2005) who verified Mg leaf content enhancement in passion fruit seedlings when doses of simple superphosphate applied to the soil were increased. These effects are also in disagreement with Kondo and Higuchi (2013), who studied different P doses on plant nutritional status and observed higher Mg leaf content when higher P doses were applied. The linear reduction and lower Mg leaf content in plants submitted to simple superphosphate is due to the inhibition of absorption of this element caused by increase in K (Figure 2B) and Ca content (Figure 3A), as these nutrients compete for the same adsorption site in the leaf membranes (Malavolta et al., 1997; Marschner, 2012), associated to the high Mg of the bovine manure (Borges et al., 2002b) used in the experiment, as can be seen in (Table 1). However, even though it was reduced, the Mg leaf content in plants fertilized with simple superphosphate was higher, in the range of 3-4 g kg-1, which means that the crop was nutritionally balanced in Mg (Malavolta et al., 1997). The maximum Mg level obtained with the maximum physical efficiency doses of triple superphosphate is two-fold that of 4.0 g kg-1, considered as a limit value of adequacy. Because the initial content of this element in soil is considered a mean (Table 1), the applied limestone provided Mg in quantities greater than that deemed adequate for the crop. 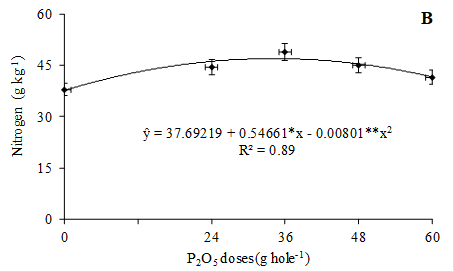 As a function of P2O5 dose, the S leaf contents increased until reaching a peak (Figure 3C) and then decreased, a tendency that agrees with the results recorded by Miyake et al. (2016) but differs from the results of Prado et al. (2005), who recorded a linear decrease in S content in passion fruit seedlings under triple superphosphate doses. On the other hand, for red alder plants (Alnus rubra), Brown et al. (2011) attested as well that fertilization with triple superphosphate enhanced S leaf content during the first year growing the crop. The superiority of S contents in plants fertilized with simple superphosphate is because this input contains 12% of S in its composition, which does not occur in triple superphosphate. According to the results, it was verified that independent of source supplied, the maximum contents obtained are greater than 2-3 g kg-1 meaning that the plants were properly supplied with S (Malavolta et al., 1997). Although triple superphosphate does not contain S in its composition, plants submitted to this treatment were also properly nurtured with S. This nurturing occurs because the manure used in planting pit preparation provides S for the plants; furthermore, this element may be absorbed in low quantities from the atmosphere by leaf absorption. Although there were positive effects of simple superphosphate on B leaf content (Figure 4A), the values observed for both P sources are well below the B range of 40-50 mg kg-1, considered adequate for the crop (Malavolta et al., 1997). Prado et al. (2005) attested that enhancement of P supply, in simple superphosphate form, resulted in a decrease in B leaf content for yellow passion fruit seedlings. The Ca and Mg of the limestone with the Ca supplied with the P sources possibly increased the soil pH, impairing B absorption. In addition, Borges et al. (2002a) evaluated the effect of phosphorus doses (simple superphosphate) on the nutritional status of passion fruit and recorded no effect on B leaf contents. Although there was a wide range recorded for Cu and Mn leaf contents (Table 4), all average values are below the limits of 10-20 mg kg-1 and 400-600 mg kg-1 considered adequate for yellow passion fruit, respectively (Malavolta et al., 1997). Regarding Fe, when it is considered that passion fruit plants properly supplied must contain leaf contents between 120-200 mg kg-1, it was observed that plants were also impaired in terms of this micronutrient, except in plants not fertilized with P2O5 and those treated with 24 and 36 g hole-1 of P2O5 in simple superphosphate form. Low availabilities of micronutrients, associated with high soil pH due to the lime and calcium provided by the P sources, may have decreased the absorption of Cu, Fe and Mn, resulting in values below the critical limit, impairing the plants (Malavolta et al., 1997). This follows Santin et al. (2013), who concluded that high doses of lime decrease micronutrient absorption by the plants. Despite not being significantly influenced by the variation in sources, Zn leaf contents contained in Table 4 are within the range of 25-40 mg kg-1, considered adequate for the crop by Malavolta et al. (1997). Prado et al. (2005) and Lemos et al. (2015) verified that enhancement in P supply resulted in low Zn contents in passion fruit and coffee plants, respectively. According to Malavolta et al. (1997), the higher P absorption by plants may result in lower absorption of other nutrients such as Zn. In contrast, Borges et al. (2002a) in a study performed in a sandy loam soil, recorded no effect of phosphorus doses on Zn leaf content. Higher simple superphosphate doses also promoted high Na leaf contents (Figure 4B), a result that is in agreement with Silva et al. (2015), who attested enhancement of Na leaf contents in wild passion fruit plants fertilized with simple superphosphate. In addition, the higher Na leaf content promoted by triple superphosphate in relation to the simple superphosphate occurred because it contains higher Ca level in its composition, which favours larger Na displacement in soil charge sites, resulting in leaching and a decrease in its availability to plants (Leite et al., 2010). In general, the sodium contents observed are below toxic levels for plants, that is, 0.25-0.50%, respectively, 2500-5000 mg kg-1 of sodium in leaf dry mass (Dias and Blanco, 2010), which means that crop nutrition was not compromised by accumulation of the element detected in the leaf dry mass. Phosphate fertilization promoted adequate nutrition for passion fruit plants in terms of N, P, K, Mg and S, independent of the source provided, but promoted adequate Ca only for doses up to 36 g hole-1 of P2O5. Additionally, triple superphosphate enhanced the leaf content of N and Mg and simple superphosphate Ca and S.
Except for B, the micronutrient leaf contents were not influenced by P2O5 doses or sources. Plants were impaired in B, Cu, Fe and Mn, except for Fe in those not fertilized with P2O5 and those treated with 24 and 36 g hole-1 of P2O5 in simple superphosphate form. Considering the adequate nutritional status for passion fruit, it is recommended that a fertilization of 36 g hole-1 year-1 of P2O5 be applied, whether simple or triple superphosphate.